Alexandre Brongniart, a French chemist and geologist, was born Feb. 5, 1770. Among historians of geology, Brongniart is best known for publishing a geological map of the Paris basin with Georges Cuvier, and for discovering, along with Cuvier, that fossils can be used as indicators to identify different geological formations. In the English-speaking world, we usually credit this important discovery to William Smith, but Brongniart and Cuvier were independent discoverers of the principle of biostratigraphy, which has been indispensable to geologists ever since. The Cuvier/Brongniart geological map of Paris is a large folding hand-colored affair; it was first published in 1811, and then again in 1822 and 1835; we have all three editions in our History of Science Collection. We show a detail from our copy of the region around Paris (first image), and the entire map (second image). To historians of art, Brongniart is known for directing the national porcelain manufactory at Sèvres, from 1800 until his death 47 years later. Sèvres is some six miles southwest of the center of Paris – you can barely make it out on the map detail, right on the line that runs from central Paris to Versailles. The factory there was established in 1756; the view we show was sketched in 1817 (third image). About 1770, the French discovered a source of kaolin in France, which allowed Sèvres to begin making hard-paste porcelain, the kind the Chinese had been manufacturing for centuries but which the West had been unable to duplicate. It is said that the reason Brongniart was mucking about in the Paris basin in the first place was that he was searching for other sources of kaolin. Brongniart also founded one of the first ceramics museums in the world, the Musée national de Céramique-Sèvres, located right in the factory at Sèvres. 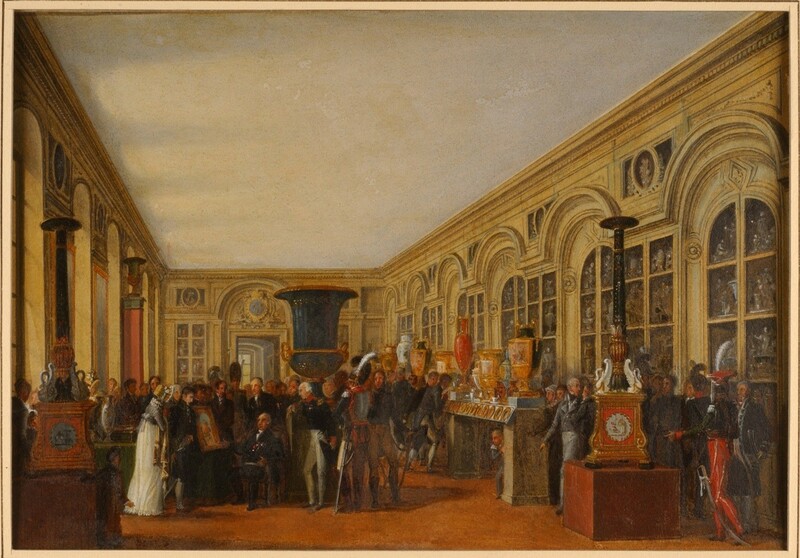 We show a view of the collection, made shortly before the Museum was formally established in 1824 (fourth image). 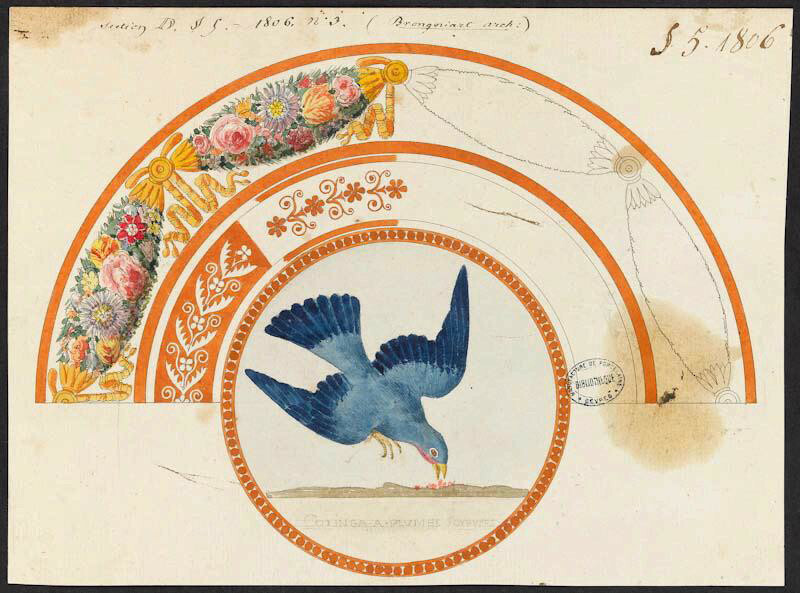 The Museum has an extensive archives; one document posted on their website is a sketch for a porcelain service that was apparently made by Brongniart himself in 1806 (fifth image). There are quite a few Brongniart portraits that turn up in an online search; we like this one, a pencil sketch turned lithograph (sixth image). Brongniart was the son of an important architect and the father of another renowned botanist, so the Brongniart plot in Père Lachaise Cemetery in Paris is quite busy with marbles and obelisks. In this view (seventh image), the large stone at the left, crowned by an urn, marks the resting place of Alexandre and his wife. We hope they like chrysanthemums.